This product is a 5 panel urine drug test kit from Rapid Response. It’s a urine dip test that detects five commonly abused drugs simultaneously. Its one-step operation produces results in less than three minutes. A very accurate analysis that ensures precise results with every test. 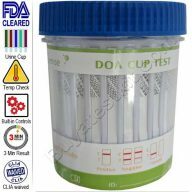 5 panel urine drug test kit. We cannot stress enough how vital a drug test is when it comes to establishing drug abuse. This test detects five of the most commonly abused drugs within minutes. Recommended for employers and parents testing their teens at home. Employers and parents depend on full trust and confidence when confronted with suspicion of drug use. The only way to be entirely convinced is to periodically test their urine with the Rapid Response 5-panel urine drug test kit. There is nothing more accurate than Rapid Response drug tests. Using this device will deter drug abuse and is an essential part of protecting your employees and loved ones from the perils of drugs, whether it be from street drugs or prescription drugs. This Rapid Response 5 panel urine drug test kit is an instant, one-step test that has cut-off levels that comply with cut-off standards that meet with NIDA recommendations ensuring accurate testing together. Perfect for use at home or the workplace. To access your child or family member for drugs. Probation situations and or inmates in law enforcement facilities. Shipped in packs of 25 kits per box. Used by professional test labs throughout the USA. We strongly recommend you read the procedure for conducting a drug test. Remove the card from the sealed foil pouch. Remove the cap to expose the fingers. Ask the person being tested to provide a urine sample. Use a suitable specimen cup like this to collect the sample. Before testing, make sure the sample passes the temperature test; this is very important, the temperature has to be within 93 to 98º F.
Dip the tips of the fingers into the urine specimen and hold them there for around twenty (20) seconds. Remove the card and replace the cap. Lay on a flat surface and observe the pinkish red bars appear. From the illustration above it will be easy to understand the test result. After a few minutes, the assessment will become apparent; document the result for future reference with our free administration form. It is possible to photocopy the face of the test card by placing it face down on your photocopier. Lines appear in the corresponding window for each drug tested; this is called the (T) or test line. Note: If the line is faint, the result is negative. In conclusion, by using this test, you can be confident that every person who passed their test is free from the drugs tested. 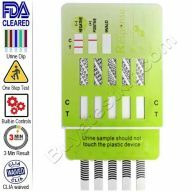 5-panel urine screen is the most accurate and reliable urine drug test kit available, employing the very latest techniques, with flood-proof design ensuring accurate and reliable results every time; An excellent product at any price. The links below provide documentation for 5 panel urine drug test kit. Just click and print the documents for all your tests.